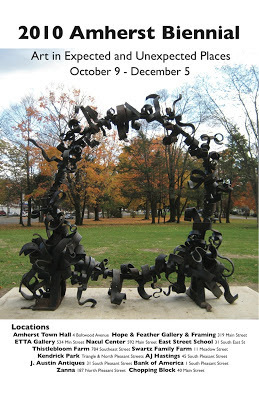 Amherst Biennial: Show Me the Love! 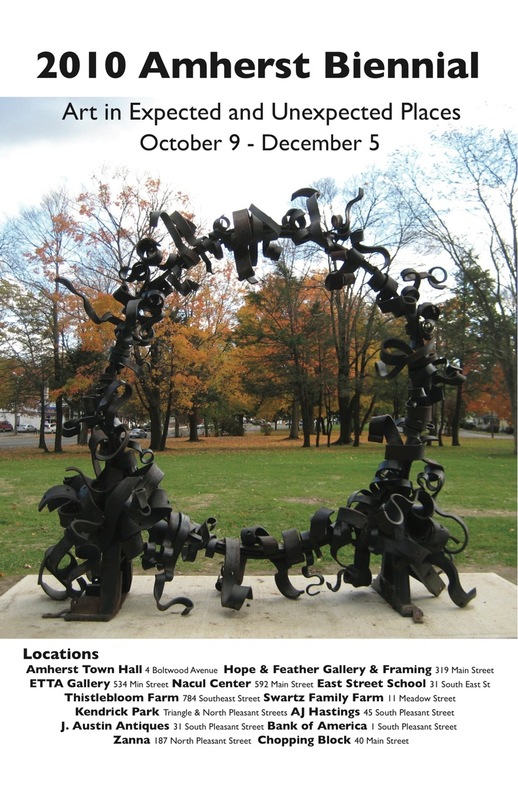 For the Love of Art, the Amherst Public Arts Commission is launching a fundraising campaign starting today, Valentine's Day to raise the last $3,000 (we have commitments of $7,000 towards the $10,000 purchase price) to make Matt Evald Johnson's sculpture the first public art piece permanently in Kendrick Park, Amherst, MA. So we re offering gifts to art lovers who help us meet this goal. For donations of $1 - $25, will receive a copy of the poster from the first Amherst Biennial. For the $25 - $99 Art Lovers will receive a copy of the poster and a personalized signed copy of the Biennial catalog by the artist, founder Terry Rooney & Matt Johnson . Donors for a $100 & up will receive a signed Giclee by the sculptor, Matt Johnson. (also will receive special note on Biennial Page as an Art Angel) $1000 donors will be listed on a bronze title plaque of the Portal sculpture in Kendrick Park. We'd like to thank the Amherst Business Improvement District for their kind support for this project with their committment of $3,500 towards the purchase of this evocative contemporary sculpture. Also the Amherst Cultural Council, Massachusetts Cultural Council, Anonymous Donors and the Amherst Public Arts Commission for helping make this happen.